If you’ve been receiving less than stellar reports during your dental checkups, then it might be time to explore the benefits of today’s power toothbrushes. Dentists in Henderson NV have recognized the positive impact that some power toothbrushes can have on your oral health, but there are a few things that you should know before you take one home. Choose wisely. The quality, cost, and performance of power toothbrushes can vary broadly, and not all brushes are created equally. Take the time to read the claims that are made by the brush manufacturer and look for supporting information like research studies and clinical reviews. Dentists recommend that you look for special features like timers and intensity settings rather than Bluetooth connectivity or social media links. Change the brush head as recommended. Power toothbrushes become significantly less effective when the brush head is old. However, the bristles may still look as good as new, even after 3-6 months. For this reason, follow the manufacturer’s recommendation for replacing the brush head, no matter how well the bristles appear to hold up. It still takes 2 minutes. A power toothbrush doesn’t equate to a faster toothbrushing experience. It still takes at least two minutes to properly brush your teeth, gums, and tongue! Change your technique. It’s important to slow down and angle the bristles of the brush towards the gum line for a proper cleaning. Check the toothbrush package for hints and diagrams that could improve your brushing technique. It doesn’t do everything. 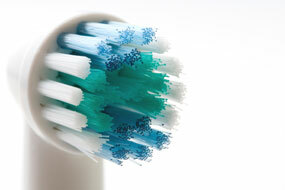 An electric toothbrush won’t replace flossing. Choosing the brush with the most bells and whistles won’t eliminate the need for flossing. Most power toothbrushes can remove plaque more effectively than manual brushes, but no toothbrush can adequately reach between the teeth to remove the plaque that is responsible for cavities and periodontal disease. For more information and tips on getting the most out of your power toothbrush, contact a dentist in Henderson NV today.